Get sprites for the Ride Pager key item and write the description, etc. the Macho Brace, and Gems besides Normal are also unused. Pokémon Sun and Moon features the quest of Lillie trying to keep Nebby in that bag and regain her confidence after a fateful childhood. Well, there's also a little sidequest where you catch Pokémon and beat trainers and become the champion of Alola, but that isn't too notable. For the sake of consistency, every Pokémon in every Pokémon game is given a Shiny variant. Most Shiny Pokémon have been obtainable through random chance encounters or event distributions, including most Legendary Pokémon. However, a few Pokémon cannot be obtained in this form without hacking, and as a consequence, normal players would never be able to see their Shiny coloration. Zygarde - Zygarde cannot be received as Shiny in Sun and Moon. The collective of Zygarde Cells and Cores is locked to never be Shiny when they are formed together. 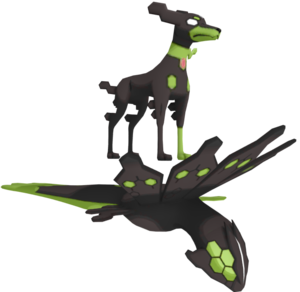 However, a Shiny Zygarde was later distributed to Generation VII games as part of an event. Solgaleo, Lunala, and Necrozma - The encounters of these legendary Pokémon are Shiny-locked, making it impossible to obtain their Shiny variants in the game. Tapu Koko, Tapu Lele, Tapu Bulu, and Tapu Fini are also Shiny-locked, but were distributed to players during events. While Shiny-locked in these games, Nihilego, Buzzwole, Pheromosa, Xurkitree, Kartana, Celesteela, and Guzzlord can be legitimately caught Shiny in Pokémon Ultra Sun and Ultra Moon and traded to Sun and Moon. Cosmog and Cosmoem - Cosmog can be obtained as a gift after the game's completion, however, it's also locked to never be Shiny. Being that the only way to obtain Cosmoem is to evolve Cosmog, the player can't obtain a Shiny variant of this Pokémon either. Eternal Flower Floette: It's still left over from X and Y, but it's still unused. As a result, it's still impossible to get a Shiny variant of it. Its stats remain the same. Magearna (Both Formes): Event Pokémon are Shiny-locked, so the player can not obtain a Shiny Magearna by any means. Get an attack animation showing the Shiny coloration. Marshadow: As with Magearna, Marshadow is an Event Pokemon and cannot be obtained as Shiny. Note that the Shiny coloration isn't a visible change until it attacks. Once again, every item in the index of the previous games are in the game files, used or unused. While the Apricorn Balls are now obtainable again and the Mega Stone is now obtainable as well, everything other unused remains unused. See this page for details. Was apparently going to be a Key Item at one point. Since the Ride Pager can be used by pressing Y once it is obtained, this item goes unused. In the Generation VII games, it is possible to find Pokémon with special "hidden Abilities". However, some Pokémon can not be obtained with their hidden Abilities through any legitimate means, rendering the hidden Abilities unused in normal gameplay. Thank you for playing Pokémon GO! Please pick up your gift from the deliveryman in any Pokémon Center. Thank you for playing Pokémon GO! You have already picked up your gift from the deliveryman. "Pokémon GO" is also listed in the location table as both a special location (Like "a link trade", "the Kanto region", etc.) at 0x753C, and as a gift location (Like "a faraway place", "GAME FREAK", etc.) at 0x9C94. Just like in X & Y, AZ's Floette has its own unique cry, a slightly modified variant of Floette's normal cry. However, because the Forme itself still remains unobtainable, its cry goes unused. A slightly extended version of the basic obtain item jingle, me_nj_item. As in Pokémon X and Y and Pokémon Omega Ruby and Alpha Sapphire, a remix of the "Battle! VS Champion" theme from Red and Blue is included to be used in the finals of the Pokémon Video Game World Championships tournament. It is identical to the one in the Generation VI games. An unused location header with the ID 0x42 reveals that Akala Island would have featured a meadow, just like the other islands, but it was eventually included in Royal Avenue. This means that the text Akala Meadow is unused in the final game. A map of Earth. This texture seems to originate from Microsoft's DirectX SDK sample programs. 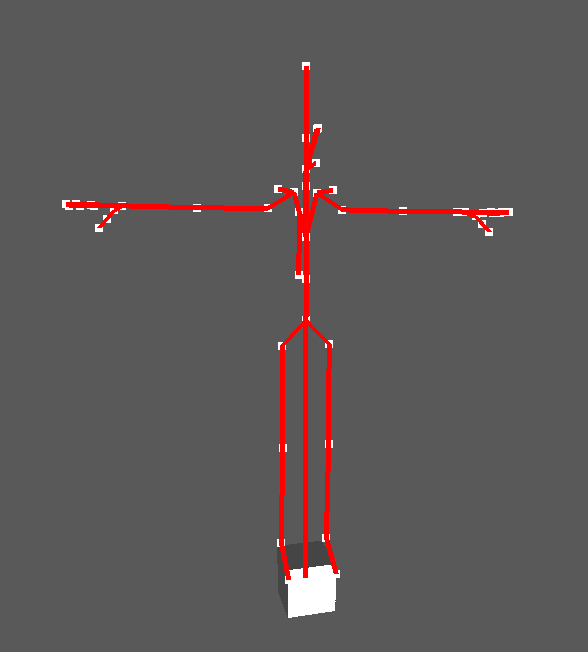 The first two files in "a/1/9/6" contain this cube model. The skeleton suggests it was meant to test player movement or animation during the initial phase of development. Specifically: Where were these models found? Who found them? What appears to be a helmet worn by various trainers can be found in their files unused. 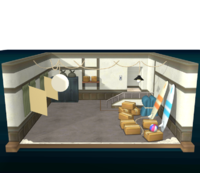 In a/0/8/1 "039.bin" there is an unused Gym battle background model that goes unused in both Pokémon Sun and Moon and Ultra Sun and Ultra Moon, possibly intended to be used in the Kantonian Gym in Malie City in the latter. However this still goes unused in both games; the final gym has a less futuristic design and uses a generic-looking indoor background. 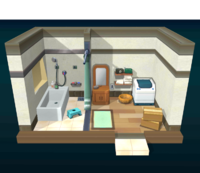 There are three unused rooms in the player's house: a bathroom, a laundry room, and a garage. Their models are found in a/0/8/6 "dec_0233.bin" for the laundry room, "dec_0241.bin" for the garage, "dec_0247" for the bathroom, and the textures are in a/0/8/3 "dec_0232.bin" in Pokémon Moon, while some of the garcs are in different locations for Pokémon Sun. 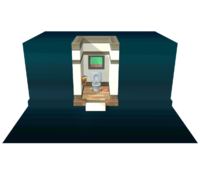 These rooms also go unused in Pokémon Ultra Sun and Ultra Moon. Found in a/1/9/6 "166.bin & 167.bin" are models and animations for an overworld model of both 50% and 10% Zygarde Formes. The overworld model of 50% Zygarde appears in ’’Pokémon Ultra Sun and Ultra Moon’’. Find out if any of these animations are used in a cutscene. All Pokémon in the game (including Mega Evolutions and alternate forms) have animation files for their in-battle models that show them walking and running (or flying/moving in an appropriate fashion at a slower and quicker pace). 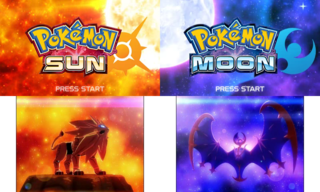 These animations are in a file separate from battle or Pokémon Refresh animations, and this file has several empty animation slots which imply other animations were planned. 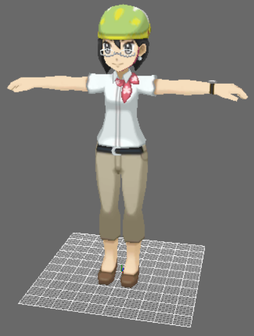 Pokémon seen in-game walking around in the overworld use a different less-detailed model, with more movement animations (specifically animations for starting, stopping, and turning) which the battle models do not have. FieldDebug.cro and SeqEditor.cro do seem to have some level of functionality, check what they do and if it is possible to force the game to load them. Just like in Pokémon X and Y, there are leftover debugging-related CROs (the 3DS equivalent of a DLL). Unfortunately, the majority of them are useless, since the game does not load them at all and they are also stubbed, only having the basic CRO loading code, leaving only their filename for you to guess their purpose. * @brief GF-Archive file index definition. * @note This file is created by GAMEFREAK Archiver. A leftover from the GAMEFREAK Archiver. To put it simply, this .gaix file is a C header that links the original file names to the GARC index; those headers are then meant to be included in the code and are used to access the files in the .garc file. Add video or screenshots of Tapu Village and Route 14 transition. The ambiance that plays in Vast Poni Canyon's Trial area is referred to as an encounter theme (alongside the other encounter themes, such as the regular Trainer theme) internally in its file name, yet it does not play for any encounters (not even Totem Kommo-o). Normally, there is a brief loading transition between Tapu Village and Route 14 where the screen fades to black. The camera angles when entering and exiting between these two areas make it appear they are two separate loaded areas. However, to the right of the normal path between these two areas is a fence with a Fisherman and a Beauty standing in front of it. The road is destroyed. If the player character clips through the fence and towards the broken road, Route 14 is already loaded into memory and completely accessible. The loading between these two areas is artificial. A rather infamous bug was fixed where using a Darkinium Z with the moves Memento and Parting Shot in Battle Spot crashed the game and declared the user the winner, forcing Nintendo to ban both moves from Battle Spot. Even when used offline, the move Memento when used as a Z-Move would not heal the incoming Pokémon as it's supposed to. In Generation VII, the battle mechanics were changed from previous generations so in a tie situation where both player's last Pokémon faint due to an attack because the opponent's Pokémon has an ability like Rough Skin or Iron Barbs, the attacker would win rather than the opponent's Pokémon, however due to an oversight this didn't apply if the opponent's Pokémon was holding a Rocky Helmet. This was fixed. A bug was fixed where Pokémon didn't learn moves if they evolve at the same level they were supposed to learn the move (i. e. Kadabra learning Confusion at level 16 but also evolving from Abra at that level). One Battle Tree Kommo-o set was changed to replace the illegal move Shell Smash with Draco Meteor. One Battle Tree Hawlucha set with a Salac Berry was replaced with a Pidgeot set with a Charti Berry. One Battle Royal Shuckle set was changed to replace the illegal move Stockpile with Double Team. A typo in the Japanese language text involving UB02 Expansion was fixed. All Battle Videos made before this patch was released can no longer be played. This page was last modified on 28 March 2019, at 16:17.